Rapper and social activist Raymond Lawrence Riley, otherwise known by the stage name Boots Riley, has been a prominent voice in the political hip-hop world for more than two decades. Lead vocalist of Oakland, Calif.,-based rap group The Coup, Riley and his bandmates have released six full-length LPs since their formation in 1991. The musicality of The Coup and Riley’s side project with Rage Against the Machine guitarist Tom Morello largely uses rock, funk and rap influences to tackle issues of race, class and American capitalism. In recent years, Riley has taken his interest in these issues and delved headfirst into the film world. After being accepted into the Sundance Institute Screenwriting Lab in 2012, Riley gained traction for his screenplay about Cassius Green, a young black man determined to succeed in corporate, white America. Riley’s film “Sorry to Bother You” was acquired by Annapurna Pictures and is set for release on July 6, 2018. The Emory Wheel and The SCAD Connector spoke with Riley about his filmmaking process, critiques of modern America and aspirations for the film’s impact. Adesola Thomas, The Emory Wheel: There is 2012 Coup album called “Sorry to Bother You” and tracks which refer to Cassius Green. How long has this story been in your head? 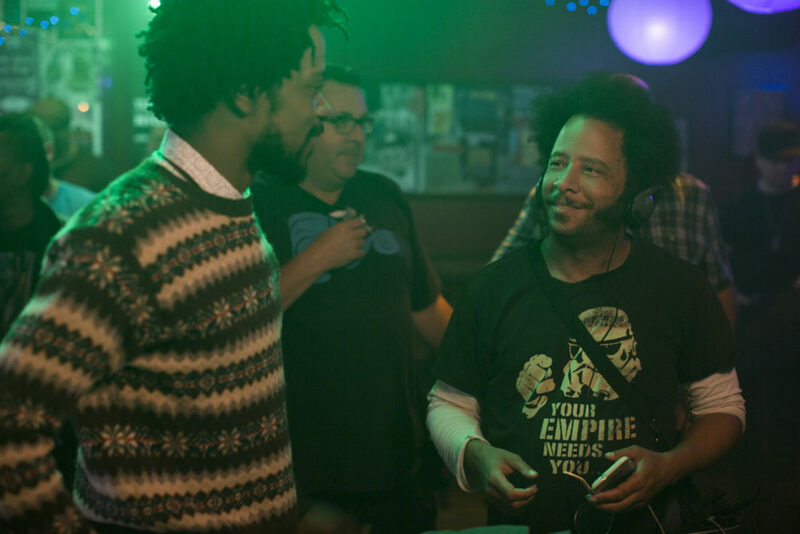 Boots Riley: I started writing it in 2011 and finished it in 2012. I did not know anybody in the film industry, so I thought by making an album inspired by the screenplay, I [would] get notoriety around it. That didn’t work. I put the album out to make money and tour. I did that for two years. Then I ran into Dave Eggers, who is a publisher at McSweeney’s. He liked the screenplay a lot and published it as its own paper-bound book and packaged it with the McSweeney’s quarterly. That inspired me, because he said it was one of the best screenplays he had ever read. He said that people in Hollywood read this, that I’d be able to get it made. So I joined the San Francisco Film Society’s Filmmaker in Residence Program and met people from Sundance and applied to their writing lab. Rebecca Williams, The SCAD Connector: What made you want to make a movie? BR: I wanted to make movies for a long time. I went to film school at San Francisco State but dropped out when we got a record deal. I have been wanting to make movies since then. I’d done this project with Tom Morello from Rage Against the Machine. It was called Street Sweepers Social Club. He did music, I did lyrics. It was not as artistically fulfilling as I wanted, and it made me think that I needed to do something with no boundaries — where I can create a world. EW: There many critiques within the film about capitalism. Did you make the film so jarring so that people would not leave being unaffected? BR: I wanted people to watch it on edge, to pay attention to what is happening and make them question what reality you know — and what else could be behind that door, inside that pothole. How you engage with it is important. A regular story could be that Cassius uses white voice, climbs up the ladder, loses his girlfriend and friends and then comes back and apologizes. He says f**k you to the boss. Then that’s the end. SC: As an artist, do you think the creative process of making music and making a film is similar? BR: It is really similar. Although to get this funded, I was like, “Hey, I went to film school and co-directed a music video.” The real skill that I had was producing music often. The bassist who is the best in the world, the drummer who thinks he is, the keyboardist who is a weird guy. Individually, they would each know way more about music than I do, but I am the one who has the vision. Not only do I have to have the vision, but I have to get them to buy into it. I have to get them so entrenched that they want to help make that happen. I have to realize that that guitar riff that I thought was good was nowhere near as good as the one you did accidentally. I have to replace my personal ego and have that attached to the vision of the finished product. On the way to getting the movie started for production, you have to deal with everyone’s ego. If you’re in a van for 10 hours and someone has their feet up and another person is upset, an argument will ensue between the person that doesn’t want to admit that they are wrong and the other person complained. You have to be able to deal with all of those things. Also, with being an organizer with Occupy Wall Street, there would be police trying to shoot at us with tear gas while we would figure out if we were going to go back around the block. Being in chaotic situations taught me to how to stay focused in the midst of things. EW: The film is largely allegorical for our world. Do you think that, like in the film, capitalism inherently promotes discrimination and slavery both domestically and abroad? BR: Capitalism itself is economic exploitation. It means folks who do the work don’t get paid the full value of the thing they do the work for. If you don’t have that, then you don’t have capitalism. It is also the motor by which it runs — meaning that that is where our power lays. We can shut it down by withholding our labor. What you said is true about discrimination and slavery abroad and domestically, but the film ultimately comments on what we can do. Both Detroit and Cassius find out that, if art is just making a statement about what is wrong, it really is not helping anybody. The thing that helps is where our power is to change it. Sometimes, something needs to be exposed, but rarely is it telling anyone anything new. It needs to be more than a complaint, exposing something is not enough. That is somewhat of the lesson.